The role of women in nation building. In the olden days, women were over looked. As a result of the patriarchal nature of the society, women were seen as inferior. Most times, they were just active in the private sphere. For the public sphere, they were not given the chance to explore their potentials because they were only seen as nurturers and home makers. The advent of globalization has served as eye opener for a lot of people on the role of women in the society. Gender activism has stressed the importance of bringing women to the fore-fronts of national development. More and more, gender equity is becoming stressed by various organizations part of which is the issue of female leadership. More women are getting involved in politics, community development, playing key roles in the helm of affairs of a nation, likewise amplifying their voices in every sector of life. However, one can observe that there is still low representation of women contributing to national development. There is still stereotype attached to female leadership. The question is how well have women prepared themselves for leadership positions in our society? How well have women believed that they could also lead? How well have women defied all odds and taken up the mantle of leadership? It is therefore necessary for more women to rise up to the challenge and prove their abilities and capacities. From early stage, most young girls are apathetic towards happenings in their immediate environments; discussions on fashion are mostly preoccupations instead of intellectual discussions on governance and nation building. 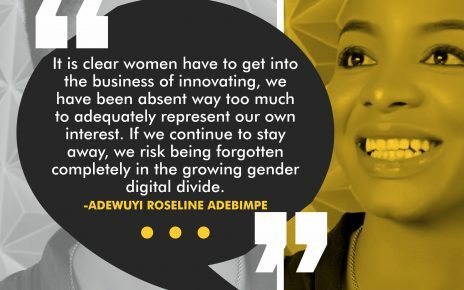 On the other hand, it can be observed that some young girls are interested in leadership positions but are not given the chance to lead therefore at the long run, the needed experience and qualification they need for high positions are not there like their male counterparts as they grow older. It is therefore necessary for more women to stand up for themselves likewise women supporting women in order to achieve this. Most often than not, when women rise up, her fellow women tend to be non supportive judging one another’s abilities based on gender which ought not to be. 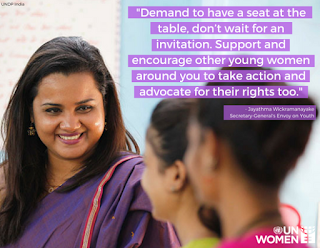 More women need to stand up for themselves in order to ensure more women are actively involved in community building. The need for women to be actively involved in community building and national development cannot be totally done without engaging boys and men. There is need for boys and men to see that there will be greater output and more development if more women play active roles in other spheres of life aside the family circle. It is highly necessary that men are actively engaged to achieve this cause for a more sustainable world. 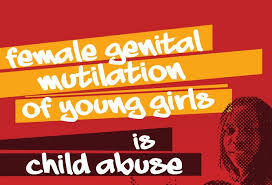 Most at times, a number of people detest female leadership because of bad experiences some have had but then I believe this is a clarion call to women that if given the chance, it should be used optimally so that it will serve as a motivating factor for other women to come not just in their generation but even generations yet unborn. I also believe that educational institutions play active roles in ensuring this. There are cases whereby women face bullying as a result of taking up a leadership position. It is disheartening that educational institutions which are supposed to be hallmark of enlightenment fuels disparity. Finally, there is need to catalyze action towards ensuring young girls get interested in nation building and also the need to equip them with gender specific leadership skills to thrive because in reality the realities a male leader faces are quite different from what a female leader faces. In all, ensuring that more women lead does not mean incompetent ones should lead but a need for equal playing grounds for both genders. It is high time we rose up to that challenge that leadership comes with a great task and one has to be exceptional and well-equipped to handle it. Women need to show the world that they can deliver. Women carry that influence but why the under-utilization. Women, rise up to the challenge and let’s see more women in position of leadership. Women can do it. 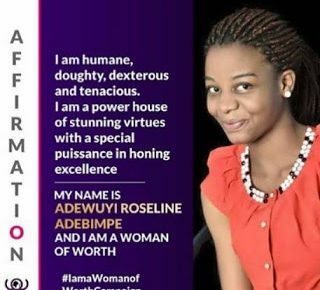 Adewuyi Roseline is passionate about the girl child. Growing up, she had a lot of questions about her identity. She is on the journey to ensure that young girls rise above limitations, smash stereotypes in their communities. Driven by genuine passion to help others find their feet firmly placed in life, I have, for more than two years, been actively championing the course of girl child empowerment and gender bias elimination in Nigeria. Currently a Masters degree student at the University of Ibadan, I hold a First class honour Bachelor of Arts degree in French language from Obafemi Awolowo University Ile-Ife. I have been public speaker in many platforms mentoring teenagers in gender capacity developments. I have participated in solving gender barrier issues with strategic programmes through public enlightenment in the media and personal contacts with community dwellers.